Maintaining high production and product standards have always been important at Lujeri. The company is confident that customers (tea blenders) and the final consumer can use Lujeri products with complete confidence as far as quality, hygiene and health are concerned. Our own internal quality management system and adherence to HACCP fundamentals ensures that a safe quality product is produced. Quality of leaf is monitored at all times and the processes, factory environments and other variables	measured and adjusted constantly. Tea is tasted in the factory at hourly intervals by skilled and experienced tea makers. 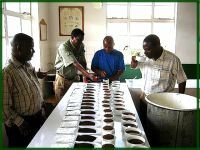 Smallholder farmers were granted Fairtrade certification in September 2008.